I have a supplier in the US whom I invoice every quarter. So I’m wondering if it’s possible to customise the date format - if not per customer, then at least to include the month name. If not, then is it ‘allowed’ in terms of accounts and book keeping to change the invoice date to 4/2 then print and send them the invoice, then switch the date back to 2/4 and save for my own records? Not a problem for us but I would have thought it safer to either use month names or the ISO8601 format (yyyy-mm-dd) than to chop and change between customers. We don’t have any way to change the date format I’m afraid, at an account level or client level. It would make sense however to allow an account wide option to be invoked for any public facing documents (e.g. invoices, statements etc). I’ll change this to a feature request for now and we’ll track this going forward. I’ve never been asked for this before, but now that I think, I have a few clients in the US so this could be something that comes up more than once. I saw this post talking about allowing custom date formats on invoices. That would be a nice feature. Any update on that since April of 2015? 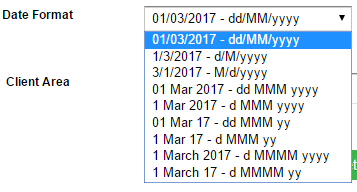 As an alternative, it might be more universally clear to switch the default date format to dd/mmm/yyyy so dates come out like 04/Mar/2017 instead of 04/03/2017. The advantage is that using text for the month avoids any ambiguity, whether your clients are US based or not, it’s always 100% clear. There is no update on this at the moment. I have however merged your topic with this thread (and re-opened it), so your interest has been noted. I’ll give this a bump as changing the output format on the actual invoice should be very straight forward.